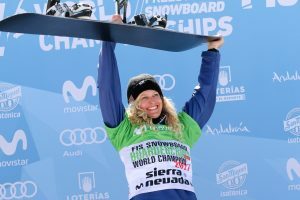 Sierra Nevada, Spain – Lindsey Jacobellis, of Stratton Mountain, Vt., prevailed at the FIS Freestyle Ski and Snowboard World Championships snowboardcross event on Sunday to claim an amazing fifth World Championship title. Jacobellis is the most dominant snowboardcross rider in history, having won at every World Championships that she’s entered. Still, she is showing no signs of slowing down anytime soon. Jacobellis, 31, edged out France’s Chloe Trespeuch, who finished second, and Michela Moioli of Italy, who was third. The men’s snowboardcross world championship title was won by France’s Pierre Vaultier for his first World Championships medal ever. Lucas Eguibar of Spain was second and Alex Pullin of Australia was third. Nick Baumgartner, of Iron River, Mich., finished just off the podium in fourth. He chose to approach the course with a combination of aggression and wisdom.